My friend, Margaret Jones, shared her nephew’s wise email with me last week and I wanted to share it with you. 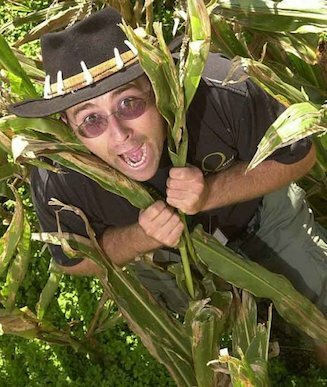 Hugh McPherson is the owner and “Maze Master” of Maize Quest Fun Park in York, Pennsylvania. He runs this on-farm entertainment attraction and supports a network of Maize Quest operators throughout North America. Find out more at www.cornmaze.com. While his message was written to inspire and motivate his network, it did the same for me. Take the 10 minutes to read it and let me know what you think! I just spent $1,200 on a clarinet for a 13 year old. There are times when, as a parent, you are inspired by your children. This has been one of those times. If you’ll indulge my “proud daddy rambling” for a few minutes, I’ll share a revealing secret I’m re-learning from my daughter and her musical journey. Sometimes you just know what’s right for you. I was born knowing I would play the trumpet. It fits me. It’s shiny, leads the melody, punches out fanfares; it announces itself. My daughter, Annie, knew long before that fateful middle school music night that the clarinet was for her. She didn’t need to try other instruments. We just signed up for the clarinet rental program from Menchey Music and left with her new instrument. Sometimes you don’t want to miss the options. My son was a different chooser. He tried everything from saxophone to cello to French horn before finding his baritone. Baritone?! Well, it’s “sweet & low” and fits him perfectly, but his “choosing style” was completely different. Ever have a goal or idea like that? It’s so awesome, then you get into it and find nothing but a pile of hard work and frustration as you try to get it off the ground. 10 minutes a day. After a few days of the crying and moaning and honking, Janine decided to reinforce the plan given by Annie’s school music teacher. All she needs to do right now, right at the beginning of her clarinet life is 10 minutes a day. That’s it. No more. What her teacher was doing, and Janine wisely reinforced, was a specific, achievable, time-limited behavior. A great 10 minutes is FUN! A lousy 10 minute practice is OVER QUICKER! Either way, she put her mind and her effort into learning the clarinet each and every day. Notice the results were unspecified, the behavior was prescribed. Those 10 minutes per day slowly, but surely, helped her grow as a musician by simply keeping a consistent effort towards success. Day after day. 10 minutes at a time. Baby steps towards her goal. Fast-forward to Fall 2014. Just two years later, as a 7th grader Annie auditioned successfully for high school District Band on her plastic, starter clarinet. She plays scales for 10 minutes. She practices up to an hour per day, because it’s FUN. It’s only FUN because she put in enough time to get GOOD at playing. She earned her vintage, wooden, “Buffet-brand” clarinet through diligence and hard work. Did she have some natural talent? Likely. Was it magical when she picked up the clarinet? No. Did 10 minutes a day yield results? Yes. Coaching. Annie’s 10 minutes per day quickly put her out in front of the other clarinet students. Not because of talent, just diligence. We realized that she was serious enough to take private lessons, so we sought out the best clarinet teacher in the area. Mrs. Lietzel has had a profound effect on Annie and her playing. There is something intangible that a good coach creates when he or she can be this third-party, non-parent supportive adult in a child’s life. Do you have a coach? Why is it that only children or professional athletes have coaches? Why don’t we as business people? Sure there are life-coaches and business coaches, but do you have one? Friendly rivalry. Annie also has been blessed with a friendly rivalry. Some farm friends of our son and his family moved back into the area to take over the reins of the family operation and they brought with them Grace Ann. GA just happens to be exactly Annie’s age, in most of Annie’s classes, and plays, you guessed it, clarinet. She plays very well, so along this journey Annie has had someone pushing her, challenging her and excelling with her. Do you have a friendly support group? A Mastermind group? A local rival who challenges you to stay sharp without squabbling? So, what are you going to do for your 10 minutes per day? Where are you going to take baby steps in your life that will add up to big, wonderful progress down the line? Learning how to make dessert wines? Complimenting your employees & walking around? 10 minutes per day = 60 hours per year. I bet you can’t imagine spending 60 hours per year on anything. You couldn’t carve out 60 hours if you tried to. You’re too busy! BUT, when you think about 10 minutes per day, it seems much more manageable. I challenge you: Choose what you want to spend 10 minutes per day doing to improve yourself and post it here. I bet we’ll both be amazed at what 10 minutes; at what baby steps can do in your business, in your life this year.